My name is Kelly Johnson; many in Cloverdale, California know me as a photographer, as a softball coach or as Darrion’s mom. What many don’t know is that I am and have been, for many years, a progressive-political activist. 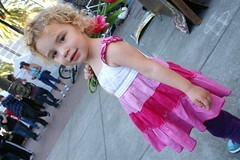 For the past 4 months I have been #Occupying San Francisco with my fellow-Family Occupiers. It’s exhausting and worth every second. It's freezing and worth every moment. It is the single most inspiring and moving experience of my life. 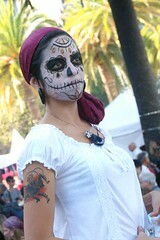 As soon as I read of the #Occupy Wall Street Movement I started looking for an #Occupation in San Francisco. I knew it would come. What I did not know is how instantly and utterly I would be swept in and how completely I would fall in love with this eclectic band of misfits. A day…maybe. At first, I was SHY. Scared to death, really. But then, one person talked to me, then another, next thing I knew, I was part of the community. There is always something to do at #Occupy, I would, like everyone else at #Occupy, see something that needed to be done and I would do it. Mostly, though, I photographed. I’ll tell you, I am an adequate photographer, I know how to expose and compose a photo. But I have never, and I mean never, shot this well. I could not believe the images I was creating. I came to understand, quite quickly, that I was being driven by my love for this movement. I know, and have always known of my craft, that I’m just a framer; I eliminate the extraneous. Isolate, focus. I know that what I shoot is there regardless of me; I just put a frame around it and freeze it, for a deeper appreciation of the moment. So when people tell me how lovely and beautiful my photos are, at first I’m honored, humbled, but at the same moment I wonder why some don’t see that what is in the photographs is actually right in front of them. Photographs are everywhere. These activists are powerful and lovely creatures, that is why the images are so lovely. As with all families, we have our own logistical and social issues to contend with, but because we are so passionate about our movement, and we know that our ends are the same, we work very hard to listen to and respect our fellow occupiers. As one of the many occupiers who work, I #Occupy 3 to 4 days a week. The transitions can be jarring. There are so many differences I don’t know where to begin, I guess the biggest difference is not feeling crazy. With the many conversations I’ve had at #Occupy I have found a vast difference in the perspectives and world views of the occupiers and folks who are not occupiers. At #Occupy we have discussions about changing our economy from a growth economy to a sustainable economy, we think that we should be developing a green energy system instead of a burning energy system, we think more should be invested in schools and healthcare rather than war and military profiteering. We think that the problems we are facing are vast and we think they are all interdependent, that is why it is so hard to nail down one issue that we are fighting for. We also think that most world citizens agree with us. Many feel it is already too late, thus justifying their inaction. Many feel that the problems are too big, thus justifying their inaction. Many feel that they don’t look like the occupiers and would not belong with them, thus justifying their inaction. I will say, that as long as we are able to justify our inaction we will continue down this path to self destruction, and I love us too much to just stand aside and watch it happen without doing everything in my power to stop it. I read once that action is the only cure for hopelessness. I also want to say, that I know #Occupying is not for everyone, but there are many avenues to taking personally responsibility in one’s society. Letters are great! Phone calls to representatives, door to door in ones own neighborhood, joining a political action group to one’s own liking. 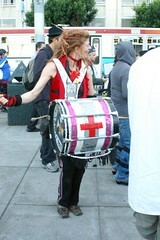 I’d like to close with what I think is the single most important conversation that happens at #Occupy. We are natural creatures; we are as much part of nature as every other living and non-living thing. That means that we have to abide by the rules that nature sets out. Give back as much as you take, and there is no such thing as waste in nature. One thing that becomes abundantly clear at #Occupy is the difference between needs and wants. And what re-use and re-cycle actually means. I believe that if we, as a human species, do not come to terms with the reality of who and what we are in the context of this lovely floating sphere, we will doom our selves and our children for generations to lives of pain and suffering. And all we have to do is change our minds.